Have you ever been in an early morning conference session where you’ve noticed that you smell like everyone else around you? Ever been in a hotel elevator in the morning on your way to a meeting and noticed the homogeneous odour? 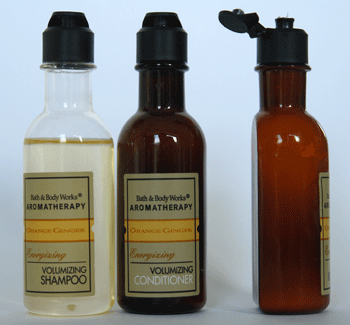 Thanks to restrictions for carry-on liquids, many people go without their own soap, shampoo and conditioner. They’re relying on what they find at the hotel. This universal scent has caused me to think a lot about hotel shampoo. It’s not easy to design a universal shampoo that will make everyone happy. It’s even harder to design an easy to use shampoo bottle. Gender-neutral. You can’t have men going on with their business day with an overly floral scent. Heavy musk scents are not acceptable on women. I found myself a little shocked when the King Edward hotel in Toronto had rose-scented toiletries. Either it was just for me or there were some feminine smelling gentlemen guests in Toronto. Placement. These bottles need to be in a place that is obvious. I generally prefer bath items separated from general items because it helps me not make the mistake of conditioning my hair with lotion. That might just be me. Ease of use. The top needs to be easy to open. It’s a fairly straight-forward idea for any type of container. However, in this scenario the guest is challenged by the viscosity of water. Something with a smooth surface that needs to be unscrewed is the worst possible cap design. One-piece design. If you have three tiny bottles in the shower and they have separate caps, you will end up with six pieces of plastic with you at the end of your shower. Integrated tops also have the advantage of completely avoiding the slippery screw top. Not round. Every bathtub or shower with a drain is designed to be sloped. For this reason, round bottles are not desirable because they roll. The bottles at the Marriott from Bath & Body Works had one flat side that helped them fit on the narrow wall in the shower. Combine that bottle with their orange-ginger gender-neutral scent and flip top, you could have close to the perfect miniature bottle. Squeeze-able. The guest should not be tapping the bottle ketchup-style. A certain amount of give to the bottle helps to get everything out easily. Inverted. Instead of a bottle, why not use a tube that has the opening at the bottom? With this design, you’re working with gravity and you do not have any time wasted on getting the substance out. In this example from an Intercontinental hotel, you can see that these inverted tubes are inverted, squeezable and not round. Sufficient quantities. If you find yourself sharing a 50 ml (or less) bottle of shampoo with someone else, someone is not going to get enough shampoo. This is also a problem for guests who don’t want their room cleaned every day. While you can phone the front desk for more free supplies, it’s unlikely that will happen when naked and wet. Recognizable. Shampoo should be clear. Conditioner should be opaque. That opaque conditioner should be in a bottle that can be easily distinguished from the moisturizer (if there is any). Shower gel should be clear but with a brighter colour than the shampoo. If the containers are written in a language that I can’t read, I need to be able to tell these things apart. Legible. The shower could be the one area where you have the largest percentage of the population with marginal vision. Combine absent glasses with jet lag and you have the perfect storm to attempt to condition your hair with shower gel. Larger point sizes are the way to go here. 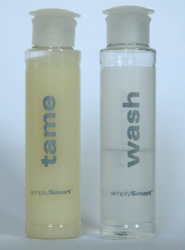 The Holiday Inn Express has the largest point size I’ve ever seen with their “wash” and “tame” bottles. However, the silver on white may not have enough contrast to make the giant verbs legible. This is overcome by sticking to principle number 8: recognizable. The shampoo is clear, and the guest just knows which one to use first. Non-allergenic. The products should not contain anything to which a guest would be allergic. Hives and rashes are several levels worse than having some problems getting the lid off. This includes all the “made from natural ingredients” products. Could a shampoo contain nut extracts? It’s conceivable. Colour-friendly. Because of the number of people who colour their hair, the product in the tiny bottle should not be stripping the colour or highlights off of guests. While it’s unlikely that this could happen with a one-time use, it could happen over an extended stay. Distinctive. To accomplish gender-neutral, non-allergenic and colour-friendly, some hotels err on the side of completely boring. For some unknown reason, Neutrogena shampoo is a popular hotel choice to achieve gender-neutral, non-allergenic and boring. 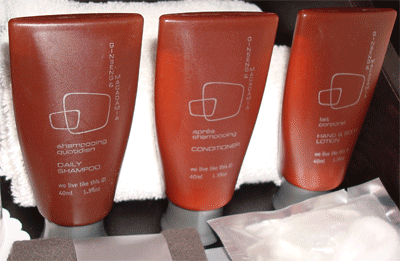 Some Four Seasons hotels use Neutrogena. It doesn’t say anything about the experience of the hotel, and most guests would find the choice pedestrian. Environment. If the hotel makes an environmental statement about offering guests the option to not wash all of their towels and sheets daily, they might want to say something about the reuse or refilling that they do on the tiny shampoo bottles. They would probably never suggest that you shouldn’t remove one bottle per night of your stay. But, they could recommend that you recycle them when you are (eventually) done with them. Separate. 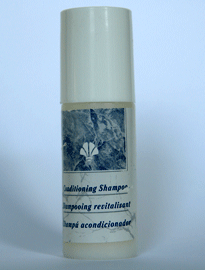 Shampoo and conditioner are separate substances. Not all guests want to have shampoo and conditioner combined. And, not all hotel guests want to end up with Pert Plus (which seems to be the hotel default). While it seems that a single-purpose bottle can simplify the guest’s experience, it’s really terrible to end up with Pert Plus. Branded. It seems like a basic concept. Tiny toiletries are a huge take-away for many guests. They take them home to represent memories of a trip – as something to which they almost feel entitled as part of the stay. These tiny bottles tend to end up on display in a guest bathroom at home. The guest wants to say something about themselves with where they stay, and -on its own- the bottle should say something about the hotel. The bottle of conditioning shampoo says nothing. I’m not even sure where it came from. Forgettable. Then, there are the hotels that go over the top with branding. The Peabody in Memphis did just that – with ducks. From left to right, the Peabody offered duck lotion, duck mouthwash, duck shower gel, duck conditioner, duck shampoo, and a duck-shaped soap. But, the duck-mania works at the Peabody. Most guests who are staying there stay for the ducks. If you have stayed there, you either took this duck paraphenalia home or you told your friends about the Peabody ducks. So, what is this about – aside from my unnatural attachment to toiletries? This is about experience design. But, you also might want to ask guests what they want, and discover what they really need. There are scenarios when what you want isn’t shampoo at all. On a few trips with diverted checked luggage, I would have loved a packet of Zero or any laundry soap instead of Aveda mint and rosemary shampoo. You can’t make a perfect bottle containing a perfect substance that is going to get everything right. And, that bottle isn’t going to be the perfect bottle for every hotel. There are compromises you have to make, and these choices are a delicate balancing act. This entry was posted on Monday, June 1st, 2009 at 9:20 pm	and is filed under Working. You can follow any responses to this entry through the RSS 2.0 feed. Both comments and pings are currently closed. Most excellent article. My favorite was the Aveda Rosemary Mint shampoo/conditioner. It has that nice gender neutral scent and is also nice to use. Sadly many hotels cheap out and go for like, Breck. Thanks! I like the rosemary mint scent, too. It’s very perky in the morning. Unfortunately, it makes a poor emergency laundry soap. Interesting post! I wish hotels would list the ingredients on their shampoos so those of us with allergies would know what we are using. It’s difficult to bring enough shampoo with you if you are flying!